Designs 4 The Web specializes in slick, mobile friendly WordPress designs that outrank the competition on all major search engines. If you haven’t ever heard of WordPress, you certainly will very soon. With WordPress powering over 25% of all websites in the world it is quickly cornering the market on content management systems. If you are unfamiliar with a content management system it is a website that can be edited using a simple interface without a single line of code. So why is a WordPress website so great? Aside from being a super slick platform for building great looking sites and allowing for easy updating, it is also the de facto champion when it comes to search engine optimization. Why you ask? With clean, semantically coded pages and a limitless supply of functionality through the use of third party plug-ins it is no wonder why search engines (and human beings) love WordPress so much. Did I mention that it is free to use? To see a WordPress website in action, look no further than your browser…Designs 4 The Web not only builds WordPress websites but also is a living, breathing WordPress website design! What are the benefits of a WordPress website? The benefits of a WordPress website design are simply too many to list, so I’ll hit the high points. I already mentioned that it’s free which in itself is enough to get most people on board. Especially, when you consider that most hosting companies charge you a fee to use their content management system and on top of it they are nowhere near as comprehensive as WordPress. In addition to the cost savings, WordPress website designs are clean and semantically coded which means they use valid, current code which helps to speed up your site and it’s search ranking. Speaking of search engine optimization, WordPress was built to get attention. Through the use of SEO plugins and an integrated blog, you will be ahead of the competition right out of the gate. If you have the need for a more scalable application with a user management system, that functionality is already built into the dashboard as well. If that’s not enough…how about the fact that you can even edit your WordPress website design on the fly with their intuitive, well-built app for both iOS and Android? Pretty cool, huh? In short, WordPress is web publishing software you can use to create your own website or blog. Since it was released in 2003, WordPress has become one of the most popular web publishing platforms. Today it powers nearly 30 percent of the entire web. What is WordPress? WordPress is open source software you can use to create a beautiful website or blog. It just may be the easiest and most flexible blogging and website content management system (CMS) for beginners. This 5-minute video provides a quick introduction to WordPress and demonstrates why it is the most popular web publishing platform today. How do I hire a CT WordPress website designer? 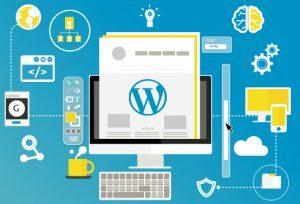 With the rising popularity of WordPress there is certainly no shortage of CT WordPress website designers and developers, but how do you know who is a trained professional and who is just picking it up as a hobby? Making the right decision, will certainly save you some time and headaches as well as money and conversions. When interviewing a CT WordPress website designer be sure to ask them to see their portfolio of WordPress website designs. It’s important to see that they have actually built with WordPress. You can also ask if they use commercial themes or build them to specifically meet the needs of the project. It is also imperative that you inquire about their process for securing a WordPress website. Most beginning developers skip this step which could leave your site hacked and abandoned forcing you to start over or even worse…changing your website address and/or business name. As you can see, it is extremely important that you do a little research before hiring a CT WordPress website designer. If you have any general questions, feel free to give us a call at 203.516.0359 or visit our contact page to send an e-mail. With over five years of WordPress experience, we guarantee that you will be satisfied with your WordPress website design and look forward to hearing from you.